The original Osage County guide was printed in the summer of 2010. Since then, 10,000 copies have been distributed to area businesses, organizations and government agencies to promote tourism, commerce and recreation in Osage County. An updated edition of the guide will be released this summer. Work has begun on the next issue of “Your Guide to Osage County,” a resource guide compiled and published by The Osage County Herald-Chronicle. 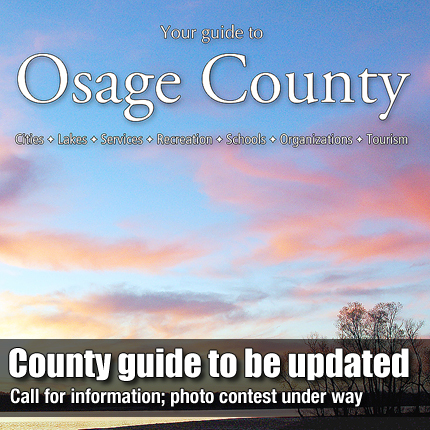 The guide includes information about county and city services, events, clubs, churches, schools, businesses, recreational pursuits, city maps and other distinctions of life that make Osage County a destination for some and a home for others. Information from the 2010 guide will be updated and new information added. Clubs and organizations throughout the county are encouraged to call or email The Herald-Chronicle to have their group information included and updated. Organizations are asked to submit meeting times, places and contact information. A community events calendar will be included and cities are asked to submit the event names and dates if known (or month of occurrence). Every effort will be made to correct errors or omissions from the last guide. An early May distribution is scheduled. Ten thousand copies of the 2010 guide were printed and distributed, in cooperation with the Osage County Commissioners, Osage County Economic Development and the cities of Burlingame, Carbondale, Lyndon, Melvern, Osage City, Overbrook, Quenemo and Scranton. Guides were also distributed to businesses throughout the area, lakes, Chambers of Commerce and Kansas tourism information locations. The newspaper will again sponsor a photo and art contest to choose cover art for the 2012 guide. The contest is now open and any amateur or professional artist or photographer who is a resident of Osage County is eligible to submit. Photographs and art are required to have Osage County subject matter and should be original. Photos must be full color, unaltered and sent at highest resolution possible. Entries may be submitted by email, with subject line “Photo Contest” to OCGuide@gmail.com, or mailed or dropped off at The Herald-Chronicle, 527 Market Street, Osage City, KS 66523. Deadline to enter is March 15. For more information, call The Herald-Chronicle, (785) 528-3511.